It looks like a problem with your custom build rule. I recommend using the latest Ice 3.6.2 version with the Ice Builder for Visual Studio instead. Thanks for the response Benoit. Today I installed latest ICE 3.6.2 version and also ICE builder for Visual Studio but no luck, still the issue remains same. also I could not see democs folder in latest ICE 3.6.2, in the other post someone written that to check whether we are able to build the demo project or not. The C# demos are now under the Ice-3.6.2-demos\csharp directory which is installed in your Documents folder. You can also get the demos by cloning our GitHub demo repository, see Using the sample programs on Windows. Thanks for the information I have used GitHub also able to successfully build the demo folders. After this I added the bin folder to PATH environment variable still the problem persists. I tried manually to run slice2cs.exe and it is running fine. But unable to build the code, please refer the log file for more information. 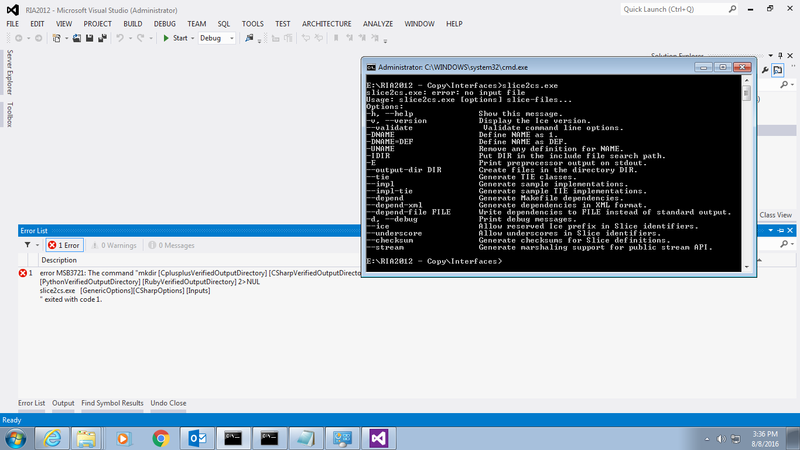 Please find the attached log file and cmd prompt screenshot. Benoit, did you got a chance to look into this. Benoit was suggesting to replace your custom build rules with the Ice Builder, which provides its own rules to compile Slice files with slice2cs (or slice2cpp for C++ projects). If you were using the Ice Builder to compile your Slice files and this compilation failed, we could help. But if you really want to keep using your own custom build rules, we can't provide much assistance. Here it looks like slice2cs is not in the PATH when you run your own build rules. Why this happens, and how to debug your custom build rules is unrelated to Ice or the Ice Builder.